The Haigh & Hastings M2 Diver Automatic with 1000 ft / 300 m water resistance. Just a couple of months ago, we reported on the imminent launch of Haigh & Hastings, a new Australian watch brand, that will make its debut with a quite promising diver watch. To learn more about their first model, the 1000-foot M2 Diver Automatic, head over to our earlier article. While at the time, they put the launch date for January 2014, due to some unforeseen minor obstacles, the date got pushed back. However, this minor delay did not stopped the people behind this up-and-coming brand to announce today their partnership with the Perth based Super Rugby franchise, the Western Force. This partnership will provide them with a range of benefits to generate brand and product awareness. This will include the presenting of the Haigh & Hastings “Man of the Match”, where a Western Force player will be awarded a Haigh & Hastings timepiece after each home Super Rugby fixture. Additionally, Western Force head coach Michael Foley will wear Haigh & Hastings timepieces throughout the 2014 and 2015 Super Rugby season. The Western Force players will also be featured in the Haigh & Hastings “Aussie Icon Role Model” campaign. Among other “Aussie Icon Role Models”, we will also see TV celebrity chef Mark Olive, icons from the AFL, as well as other Australian personalities. Putting things in perspective, this is an amazing achievement; rugby is huge in Australia and there is no other sport that would better reinforce the Australian identity of the brand. We’re told that their website will be launch in the next few days, so keep an eye on www.haighandhastings.com. Something deep inside me is telling me that your patience will be well rewarded! 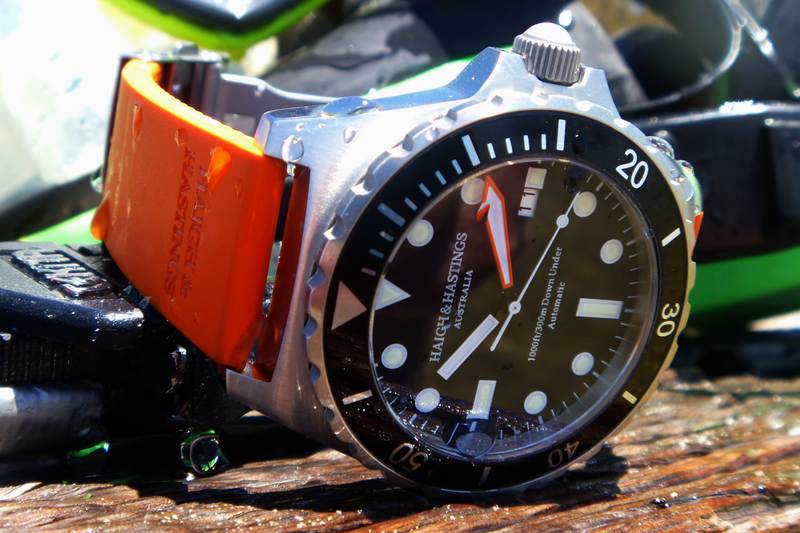 To have a closer look at the M2 Diver Automatic, check out our photo gallery.